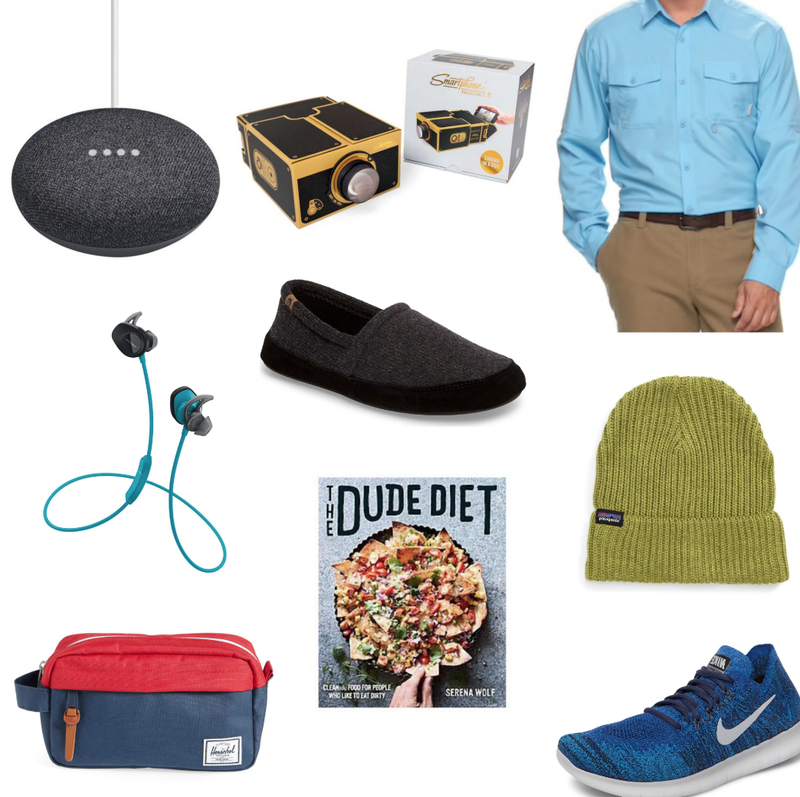 I've spent more time than usual looking through gift guides for guys this year. This is the boy and I's first Christmas together so the pressure to get a good gift is real! I picked out his gift fairly early, but Valentine's Day is right around the corner and I like to be prepared so I've looked at every guide I see for ideas. He also guessed his gift before I could actually press purchase so I was toying around with the idea of totally throwing him off and getting something different, but I know I picked something perfect so I decided to stick with it. Google Home Mini - This is actually what I bought the boy this year. When he first mentioned wanting one I thought it sounded really weird, but then I realized you can use it to control your lights and I was sold. smartphone projector - When I first saw this in the Nordstrom gift guides I knew I had to include it! Guys love getting cool gadgets and this one is a great price and unique. I know how much use you'd get out of it; but I could see this being a big hit with dads or preteens. Columbia shirt - We've bought my dad so many of these over the years and he's always stoked to unwrap one. They're labeled fishing shirts, but they're so great to wear anytime. They come in so many colors, and some fun patterns, and pack well. wireless ear buds - A great gift for someone who works out or travels often. There are so many available at a variety of price points you'll find a pair to fit any budget. slippers - Such a good gift wether you're buying for your dad or boyfriend. This is the brand our on mountain restaurants provide to guests to wear while dining and I've wanted a pair since I first slipped them on. Seriously the most comfortable things I've ever put on my feet. beanie - Living in the mountains you can never have too many beanies. I really liked how this one was simple but in a fun color. This is a practical gift he'll get tons of use from. Well I guess not too practical if he doesn't live where it gets cold. dopp kit - Another great gift for the guy that travels and available at a variety of price points so they'll fit any budget. If you're looking to really wow and have a large budget you could place some plane tickets inside! cook book - Maybe it's a guy specific cookbook or one with recipes you can cook together. This is a fun gift that you can easily make more elaborate by adding some cookware or specialty food or alcohol to create something really special. tennis shoes - Help him enhance his wardrobe with a cool new pair of kicks. I'm really jealous that guys can wear tennis shoes with more things than I can, so I feel like they should embrace that privilege. If I were a guy I'd wear these blue ones every day. What are your gift ideas for guys?